Discover the wonder and mystery of the underwater world and more through our camps, overnights and day programs! To register, make reservations and check availability for any of our Family Programs, please call 713-315-5112 or email AquariumHouston@ldry.com. Have an up close encounter with one of our ambassador animals! Depending on the animal you may be able to feed, touch, train, and/or get a picture taken. You can meet our sloth, porcupine, serval, parrots, snakes, lizards, birds of prey, or any other small mammal. Available by appointment only, Monday – Sunday between 11:30am – 2:00pm. After 2pm is available upon request with a two weeks’ notice. Please call 713-315-5109 for appointment and pricing. We look forward to enhancing your adventure! We have more than just fish here at the Downtown Aquarium! 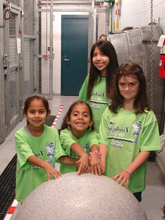 Young animal lovers will spend the day learning how we care for our creatures that live outside the ocean. Participants will go behind-the-scenes, interact with live animals, build animal enrichment, meet our knowledgeable animal care team, and much more! T-shirt and lunch included. Explore the rainforests of the world and learn about conservation through the eyes of a tiger. Get ready to stay up late, learn all about tigers, do crafts, go on a scavenger hunt, and sleep within inches of these amazing animals. Perfect for scout groups and birthday parties. Includes a snack, T-shirt, and hot breakfast in the Aquarium Restaurant. Upgrade your adventure to an Ultimate Tiger Sleepover to include a kids meal, cake, plush souvenir, All Day Adventure Pass, and three midway games. Cost: Daily: $70 per person (plus tax);1 complimentary adult with every 5 kids in a group. Minimum of 10 guests, including children and adults. Please call or email the Education Department for available dates. 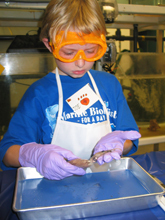 Join us each summer for fun, learning and adventure! Each week our Sea Safari Camp has a unique theme that is sure to excite everyone! All camps include hands-on activities, games, crafts, snacks and lunch, up-close animal encounters, rides, and Aquarium tours. Please check our calendar for specific camp dates. Call or email the Education Department to receive your registration packet. If you have a teenager interested in a career working with animals, then sign him/her up for a day of Working on the Wild Side at the Downtown Aquarium! This program takes teens behind-the-scenes to learn more about animal care, training, conservation, and the zoo/aquarium industry. 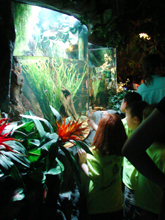 Includes hands-on activities, tours, live animal encounters, snacks, lunch, and a T-shirt.